A long stretch of water that is eminently pleasant, this trip has the look and feel of a wild setting, despite its Iowan/agrarian surroundings. However, its length and relative monotony might tax some paddlers. But for those seeking a slow-paced, contemplative paddle along a serene, unspoiled stretch of river, this trip is just that. We recommend this level. Anything above 200-250 cfs will provide sufficient depth without scraping. Time: Put in at 11:00a. Out at 3:15p. Wildlife: Bald eagles, turkey vultures, turkey, muskrats, great blue herons, pileated woodpeckers, and a dazzling array of songbirds equal in melody and color. Like its predecessor, we are entirely indebted to the commendable Nate Hoogeveen and his excellent guidebook, Paddling Iowa, for putting this stream (and virtually all others in Iowa) on our radar. 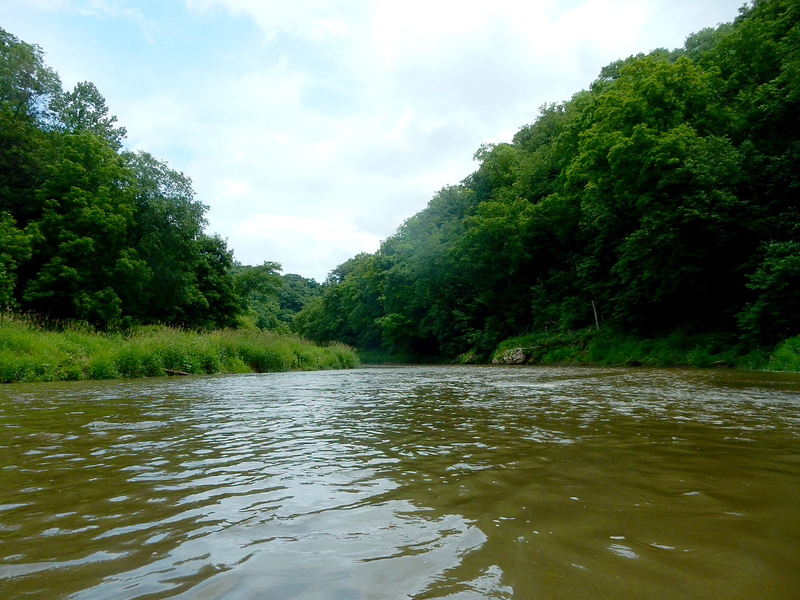 The North Fork of the Maquoketa begins west of Dubuque in Iowa’s Driftless Area. Like all of Iowa, it’s surrounded by agriculture, of course. But unlike the rest of Iowa, the Driftless Area in the northeastern nook of the state is an old, rugged tapestry of unique geology that received some kind of pardon from the gods and was spared the reckless bulldozing from the glaciers of the last Ice Age. Author Hoogeveen describes this trip thusly: “Paddlers come here looking for wildness and inaccessibility.” We’d say that’s exactly right in terms of what the river here offers. Throw in a few riffles and a ton of wooded bluffs, and you got yourself a gen-u-ine adventure. A quick word of clarity before we get ahead of ourselves. There’s a lotta “Maquoketa” going down in this part of Iowa. Ma-what-aka? Muh-KWO-kuh-ta. First, there’s the good’ole regular Maquoketa River which eventually flows through the town of Maquoketa. Then there’s the Little Maquoketa River (not to mention a Middle Fork of just the Little Maquoketa). There’s a North Fork of the Maquoketa River as well as a South Fork. Who knows how many others there are, but you get the point. Why this nexus of stream names is strictly derivative and not more unique or colorful is anybody’s guess. But in a state like Iowa with road names that are nominally numerical – and preposterously so at that; I mean, come on, 358th Avenue or 152nd Street… in the middle of rural nowhere?!? – then apparently nobody had the time or inclination to fork over more creativity. So it goes. We selected this section of the North Fork, deviating slightly from the guidebook, for the following reasons. Hoogeveen’s first trip is 18.3 miles, which is ambitious – especially in the wrong kind of boat. It begins below the dam in the town of Cascade and wraps up at the Ozark Bridge at 21stStreet. His next trip is a much shorter 7.5-mile stretch continuing at 21st Street and going down to Crab Town Bridge at Highway Y31. Excepting one notable stretch in the “middle” of the 7ish miles from Cascade to Whitewater Creek, the beginning town section and finishing farm section sound a tad mundane. Conversely, the 4.5 miles in between Ozark and Caven bridges (half of his second trip) sound downright lovely. But no way was I doing a 23-mile trip in a 10′-long whitewater boat, in Iowa, with a 2-ish hour drive back to Madison, in one day. Thus, we came up with an a la carte paddle combining Hoogeveen’s first and second trips. Plus we always enjoy the sense of continuity by beginning a trip where a previous one ended. The put-in at Highway D61 is on the downstream side of the bridge, river-right. While not a dedicated landing, it’s very accessible and fairly established, as it’s primarily used for the take-out on paddling trips down Whitewater Creek. There’s a sizeable space along the shoulder at the bridge to park a few vehicles. Expect to see a few on a warm summer day, especially if the water on Whitwater Creek is up. From here there’s only 1/3 of a mile left of the creek before it empties into the North Fork of the Maquoketa River. There was one small downed tree cluster, but it’s a minor nuisance – nothing requiring a portage. Shortly after that comes the rather lackluster confluence at the North Fork, after which there shouldn’t be any obstructions. And by lackluster all we mean is Whitewater Creek makes a t-bone beeline for the North Fork with near-perfect 90-degree angularity with nary a meander or nuance about it. Once on the big river (about double in size, or 70-100′ wide), you’ll be enveloped by wooded bluffs. Indeed, with hardly any exception, tall wooded bluffs will comprise the backdrop mile after peaceful mile all along this longish but serene trip. This river definitely lends itself on the sum being better than its individual parts. Here, it’s the cumulative experience and the subtle effect of mile after mile of undeveloped tranquility, rather than specific honorable mentions (e.g., a set of rapids, a cool old bridge, a wall of rock outcrops, etc.). It does (or doesn’t) help that there are so few bridges or landmarks either. This all might feel a smidge homogenous or monotonous after awhile (say, 15 miles), but it’s a heluva lovely monotony. To be sure, there are boulders along the banks – many of them just stupidly huge. Alas, most of them are embedded in the hills, as are the many (but reticent) rock outcrops. Roughly 5-ish miles into things a series of brief riffles precedes a totally random porch-like, duck blind/deer stand-esque structure complete with stairs, handrail, back deck, and American flag. We have no idea. It’s like a rural gazebo. But in a trip with no real development or landmarks, this thing stands out like the Arc de Triomphe. A fun section of this trip follows, where the river meanders in a few huge loops – a welcome break from its erstwhile nature of broad straightaways. Again, more rock outcrops hidden behind the trees. There is one dramatic scene, albeit brief, where a tall ridge on the left towers above the foreground treeline, allowing for an impressive display of exposed rock outcrops some 200′ high. On our trip, shortly after this we happened upon a doe and her fawn taking a cool sip on the hot day right on the river. The doe booked it up the banks, leaving Bambi pitifully alone. Having been a latchkey kid myself, I empathized. It was simultaneously adorable and heartbreaking watching the poor thing try to scamper-clamber up the banks, failing, falling, mewing like a kitten (seriously, that’s how they sound), then try-try again. Repeatedly, til it got enough footing (hoofing?) and toddled through the brush and brambles back to mom. Quite a scene. From here to the first bridge there’s not much to say; it’s a supremely scenic stretch of wooded bluffs, occasional riffles, some hidden rock outcrops, bank-side boulders, and a few sand- and gravel bars. Before the bridge, while smack dab in the meandering loop, there’s an intriguing place called Searryl’s Cave State Preserve, off the river, via the right banks… somewhere. You’d have to do your homework first, as there’s no signage – to say nothing of where you’d even try to find the cave via the river. The best we can offer is it’s in the neighborhood of these GPS coordinates: 42.21822, -90.89984. As for that aforementioned bridge, the guidebook states that the access at the Ozark Bridge/21stAvenue is directly beneath the bridge, on river-right, where there’s a makeshift trail back up to the road. Upon passing it, we saw no discernible evidence of how this bridge could be accessible, but to be fair, we weren’t really looking hard, since it wasn’t our take-out bridge. Either way, it is steep, so if you attempt to use it as an access, be prepared. It’s about 4.5 more miles til the next bridge, an especially scenic section where the river is surrounded by a swath of public land illustratively named the Ozark Wildlife Area, over 300 acres large, full of limestone bluffs, hiking trails, and primitive camping options. The river meanders in loops again here, but now with a steeper gradient (though still pretty subtle). Generally speaking, this is the prettiest section of our trip. The buxom boulders are more pronounced, the rock outcrops in the bluffs less bashful. The geology show goes a little burlesque… Even though it’s been a long trip, this stretch is especially lovely and deserves sitting down a spell to soak it all up. The rustic (and rickety) Caven Bridge at 60th Avenue suddenly appears after one last right-hand bend. It has the look and feel of an iconic iron-truss bridge we so love in northeastern Iowa. The access here is excellent; take out on river-left on the upstream side of the stately structure. There’s a well-worn path that’s short and none too steep. There are no facilities here, but there’s plenty of room for parking. One of the Ozark Wildlife Area entrances is via the Caven Bridge Access, so you might have some company. It’s hard to beat scenery like this stretch of the North Fork of the Maquoketa River. You feel utterly secluded for the entirety of this trip. The bluffs are lovely and continuous – at no point, ever, is this trip flat. The boulders are great, and the wildlife was simply spectacular. Not a wild river per se, but it sure feels that way while on the water. This would be an ultimate canoeing river; the width, gentle gradient, and nostalgic sense of how things used to be (re: still should be) all lend themselves to canoeing in particular. And while there’s hardly anything in between, the bridges at both the put-in and take-out make for excellent accesses. We’ll leave aside our own mistake of using the wrong boat for such a stream; that’s on us and bears nothing on the river itself. We won’t even bellyache about the bike shuttle being long and hot, as we recognize most paddlers are far more sensible than we and are doing a trip like this with another vehicle in mind. No, all we’ll say about this trip is that is simply runs a little long and monotonous. But in terms of a Zen/meditative river, this trip offers genuine serenity. Sure, fine – that’s all well and good – but there must be something to dislike, no? Of course there is! So, here’s the thing: we took out at the Highway D61 bridge at 7:45 pm the night before and then put-in at the same exact spot at 11 am the following day. In between those 15 hours it had rained 2.5”, and yet the water levels were identical. That is, until I’d returned to the bridge, after my long paddle and shuttle pedal. Then I saw that Whitewater Creek (and by extension, the North Fork of the Maquoketa River) had risen quite a bit – and would continue to well on into the night. But why it took so long for that effect was sincerely surprising and disappointing. We’d definitely do this trip again, but next time we’d put in below the dam in Cascade and get a taste of those seven miles before the confluence with Whitewater Creek. Then probably turn left and scamper upstream the scant 0.3 mile to the Highway D61 bridge. Heck, we’d even recommit ourselves to doing so in a 10′-long whitewater boat. Ideally, however, we’d have a canoe and either take an ambitious swing for the entire 25-ish miles in one day or, better still, primitive camp on one of the many islands along the way. Regardless, this trip is worth saving for early spring or late fall – when the trees are leafless – to better take in the many embedded boulders and “shy” rock outcrops along the bluffs. 14 miles – which is ridiculously long, and just about interminable when bike shuttling. The route we took is not necessarily the most streamlined (no pun intended), but it offered the most paved road option. Except for the short leg of 60th Avenue, which is a classic dirt-gravel country road, we took the Highway Y31/Bernard Road north to Bellevue-Cascade Road west option. There are more direct spur options, but all along dirt-gravel roads – meaning it would still take about as long by vehicle than the slightly less direct paved options. The put-in below the bridge at Highway D61 (technically Whitewater Creek). Approaching the rather pell-mell confluence with the North Fork. Now on the big river proper. Wooded bluffs for mile after mile. Attractive and new but totally random structure 4-ish miles into this trip. Hidden rock outcrops camouflaged by leafy trees. Intermittent riffles here and there. This would be a glorious sight to behold in early spring or late autumn. Wee fawn looking to be united with Mama Doe. The tall and potentially accessible “Ozark Bridge” at 21st Street. Lots and lots of boulders on this trip. Things get a little livelier after 21st Street. The geology show is a little more revealing through the Ozark Wildlife Area. The river must get pretty rowdy at flood stage. Half-expected Julia Andrews to come running down the hills singing her heart out here. Approaching the iconic take-out bridge at 60th Avenue. Well-worn path leading from the river to the parking area. View of the take-out from the bridge. The water rose quite a bit from when we’d left the put-in bridge only five hours before!